RH Series RTD’s are conventional assemblies with platinum RTD element and SPC(Silver Plated Copper) /NPC (Nickel Plated Copper) conductors. These RTD’s are offered in 2/3/4-wire configuration with single/dual elements, enclosed in a SS316 sheath which is terminated into weatherproof die cast aluminium head. Terminals heads are supplied with standard 1/2” BSP (F) single cable entry with a single compression cable gland. The RTD has a non-bendable sheath, hence sheath length above 300 mm is not recommended. These sensors are capable of measuring temperature in the range of -50 to 250°C. The sheath is made out of SS316 material which makes it suitable for a wide range of applications such as chemicals, food, pharmaceuticals. The RTD elements are terminated in to nickel plated brass terminals mounted on high purity steatite terminal block. 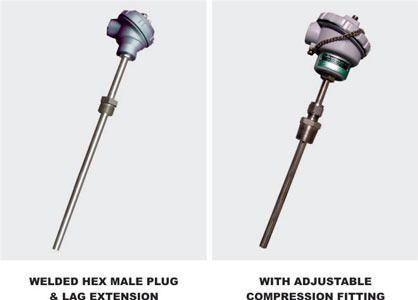 Optional heads include cast-iron, SS304 and SS316.